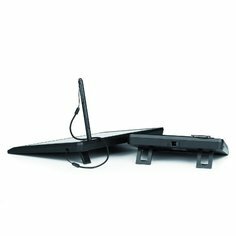 Olivetti TSP 100 and Olivetti TSP 70 are specifically designed to enable digitization of documents requiring signature, because they facilitate the change from signatures on paper to signatures on electronic device. 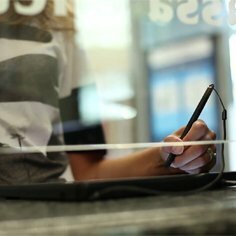 Thanks to a specially processed glass that gives the same effect as a pen moving across paper, the writing experience is even more realistic. With Olivetti TSP 100 and Olivetti TSP 70, the user can display the entire document to be signed, scroll it, check it, turn the page. As required under international standards and regulations, the signature is captured together with its biometric parameters, so that it can be used to endorse legally enforceable electronic documents. Advertising messages and customised promotional videos can be displayed on the screen before and after the signature request. Security guaranteed by a sophisticated biometric data encryption system based on RSA2048 and AES256 algorithms. 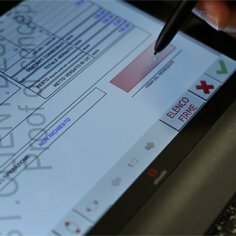 Ergonomic features for easy document display and signature. Special glass for realistic reproduction of pen movement, and anti-glare treatment to eliminate interference from light sources. Electromagnetic resonance technology to prevent wear of the signature surface. Capture of signature biometric data in compliance with ISO/IEC 19794-7. Olivetti TSP 100: with a 10'' active area to ensure display of complex documents of particular legal importance. 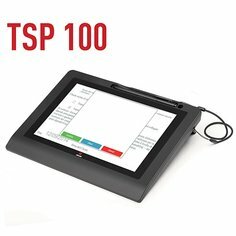 Olivetti TSP 70: with a 7'' active area, this device guarantees easy reading of the entire document, with the advantage of significantly compact dimensions and a cost comparable to that of pads exclusively for signature capturing. 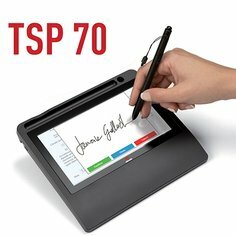 Olivetti TSP 100 and OLIVETTI TSP 70 are the best choice for digitization of documents requiring signatures, because they faciltate the change from signatures on paper to signature on electronic device.Signing an electronic document has not been so similar to signing a paper document. Thanks to a specially processed glass that gives the same effect as a pen moving across paper, the writing experience is even more realistic. With Olivetti TSP 100 and Olivetti TSP 70 the user can display the entire document to be signed, scroll it, check it, turn the page. 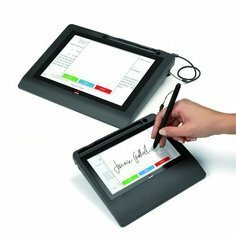 As required under international standards and regulations, the signature is captured together with its biometric characteristics so it can be used to endorse legally enforceable electronic documents. Pour les grandes enterprises et les sociétés internationales, contactez-nous directment. Direction et coordination de Telecom Italia S.p.A. - Cap. Soc. 10.000.000,00 euros e.v.